The 3rd Test between India and England is going on. 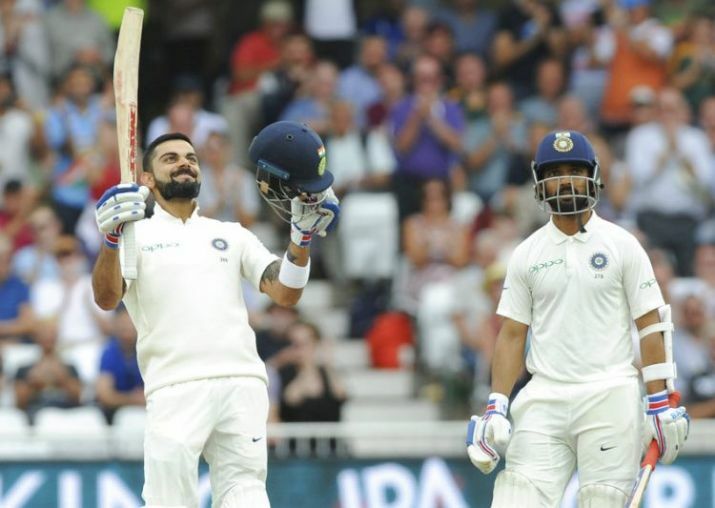 The match started in 18th August, 2018 at the Trent Bridge in Nottingham. Rishabh Pant made his test debut through the match for India. In the match team England won the toss and let India bat first. In the last two matches, team India faced batting disaster but this time, they turned around and played very impressive first innings. And according to the last news, team England chasing 521 runs at Nottingham. Team India started to bat with Dhawan and Rahul at their first innings. Openers did not able to add much runs but in 60 runs opening partnership was broken. Dhawan scored 35 runs and Rahul scored 23 runs so far. In their first innings just two players named Virat Kohli and Rahane played well. Kohli scored highest 97 runs and Rahane scored 81 runs so far. They played 94.5 overs and scored total 329 runs. Woakes, Broad and Anderson took three wickets each for the team England. Later, England came to bat for the first innings. Their known ground became unknown. Openers added 54 runs but at the same time two wickets were gone. If we consider their top scorer, Buttler scored highest 39 runs for the team. Cook scored 29 runs and Jennings scored 20 runs respectively. Scoring 161 runs in 38.2 overs team England lost all wickets. Pandya destroyed English innings by taking five wickets to far. Bumrah and Sharma took two wickets each for India in the first innings. Later, India came to bat for the 2nd innings. They wanted to present a big score in front of England and so, that England cannot chase the score. So, Dhawan and Rahul once again opened the innings of India. This time once again, they added 60 runs jointly. Rahul was gone with 36 runs and Dhawan scored 44 runs so far. Pujara and Kohli played well and this time Kohli made no mistake but took century successfully. He scored 103 runs in the second innings and Pujara scored 72 runs so far. Among rest players, Pandya remained not out with 52 runs and Rahane scored 29 runs. By losing seven wickets team India scored 352 runs and declared the innings. So, England has to chase 521 runs totally in the 2nd innings which seems almost impossible. Among English bowlers, Rashid took three wickets and Stokes took two wickets so far. According to the last news, Cook and Jennings started to bat for the 2nd innings of England and they are onn the crease with 9 and 13 runs respectively.